This post originally appeared on April 1, 2015. 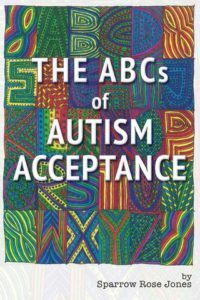 The book that resulted from this Autism Acceptance Month project, The ABCs of Autism Acceptance, is available from Autonomous Press. You may have noticed in the last half-decade or so that there is a growing trend toward speaking of autism acceptance instead of autism awareness. By now, most of you probably know why people are making that choice, but just yesterday I saw a lot of people arguing about the topic, so I think we still need to make it clear. Autism awareness, in and of itself, is not inherently bad. By now, most people are aware that there is a thing called autism but, in my experience, most people are not very aware of what that autism thing actually is. So I do, at least partially, agree with the people who say we still need more awareness. What I have a problem with is the form that awareness tends to take. A week ago, I had to stop listening to the radio because all the stations were already gearing up for April with lots of “awareness” and lots of advertisements about awareness events. I heard a lot about children with autism and nothing at all about Autistic adults. Not only do we “age out” of most services when we turn 18, but we also become invisible. It’s as if the entire world stops caring about us once we are no longer cute children to worry about and, instead, inconvenient adults to be stuck with. I heard a lot of scare talk, including hearing us repeatedly compared to diabetes, cancer and AIDS. Diabetes, cancer and AIDS kill children. Autism does not. Diabetes, cancer and AIDS are illnesses laid on top of a child’s underlying identity — they can change a child’s philosophy but they do not change innate aspects of their identity. Autism is a cognitive and perceptual difference that is so deeply rooted in our neurology that it cannot be separated from our identity. Beneath cancer, there is a healthy child hoping to break free. Beneath autism, there is more autism — it’s autism all the way to the core. Autistic children do not “go into remission,” they develop coping skills and they mature into Autistic adults, and they work to learn ways to communicate with those around them with help from their peers, friends, family and increasingly modern options such as social networking sites like www.specialbridge.com. There might be suffering that can be alleviated — seizures brought under control, gastrointestinal disorders treated, methods learned and sometimes medications taken for mitigating anxiety. Autistic adults often do not resemble the Autistic children they once were — we grow and develop all our lives — but Autistic adults are still every bit as Autistic as they were when they were children, no matter how many coping skills are learned, no matter how “indistinguishable from their peers” they become. So that is autism awareness. That is what we are rejecting. What is autism acceptance? Autism acceptance is seeing us as whole, complete human beings worthy of respect. 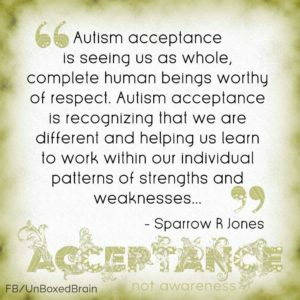 Autism acceptance is recognizing that we are different and helping us learn to work within our individual patterns of strengths and weaknesses to become the best people we can be, not trying to transform us into someone we are not. Autism acceptance is remembering always that Autistic people are listening, including those who might appear not to be, and choosing to speak of autism and Autistic people in ways that presume competence and communicate value. “Acceptance means accepting yourself as you are, even in the face of persistent attempts throughout your life to get you to be what you are not. Especially in the face of persistent attempts throughout your life to get you to be what you are not. The best you can be is Autistic. Let me explain. “The best you can be is Autistic” means that you are at your best when you are being fully who you are, able to express yourself and move through the world in ways that are right for you, comfortable for your body. “The best you can be is Autistic” does not imply impairments, “less than,” “can only do so much.” On the contrary, it means that you are who you are- your pervasive Autistic self (which actually includes those parts that observers might think are “typical” just because they can’t see anything that looks unusual to them), and that encompasses all of who you are, not just the parts that have been “permitted,” and not just the stuff that whatever the DSM of the moment says are your deficits.